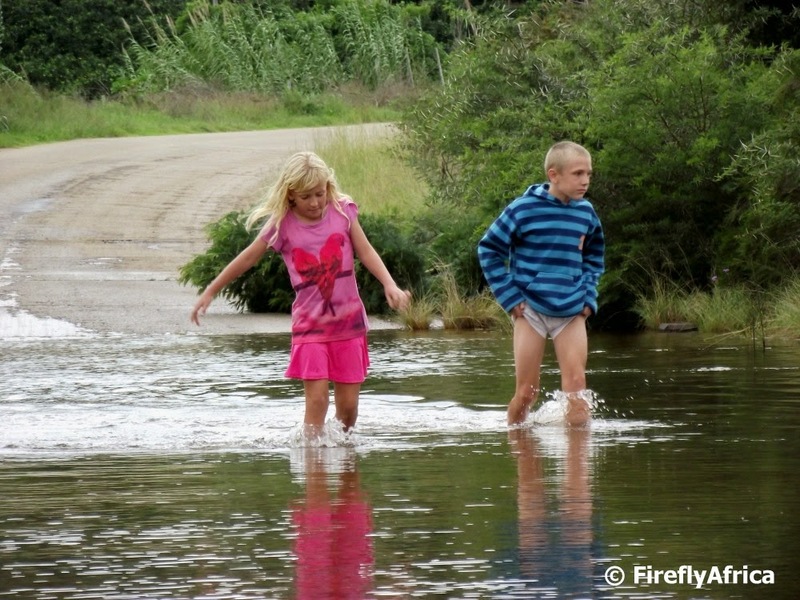 A trip up to Nieu-Bethesda a week or so ago gave me the opportunity to detour into the little village of Wolwefontein between Uitenhage and Jansenville. 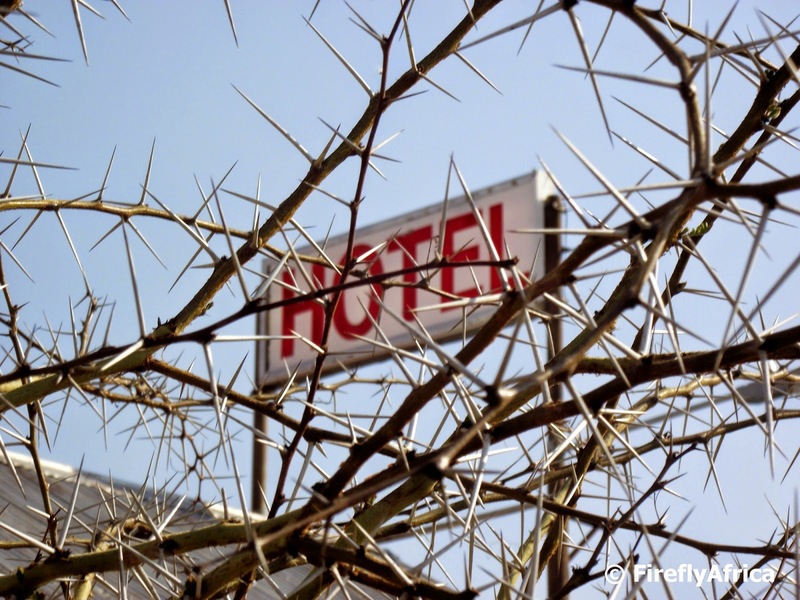 There really wasn't that much to see but the old hotel sign behind a sweet thorn tree made for an interesting photograph. 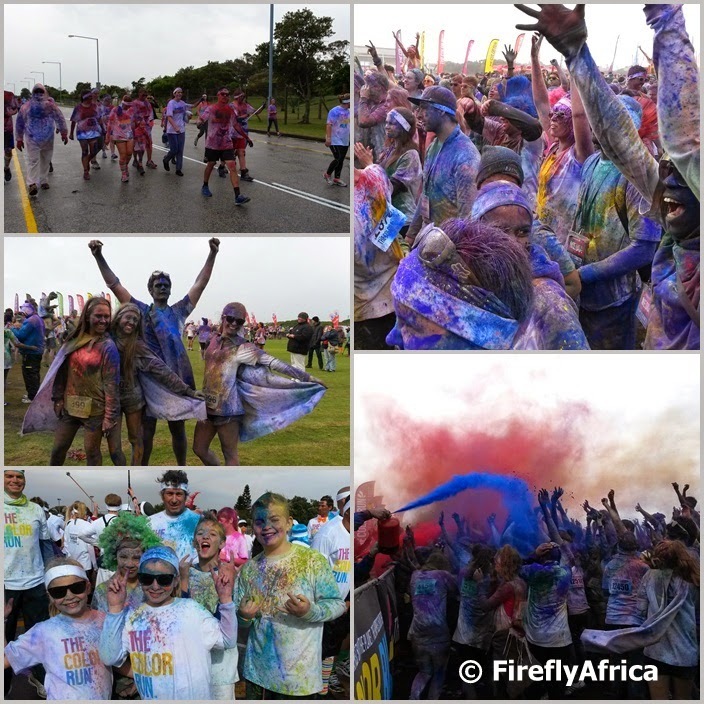 Last year the first ever Color Run in South Africa took place in Port Elizabeth, so it was appropriate for the city to stage the first South African one in 2014 again. I got an invite from Nelson Mandela Bay Tourism to come and participate in the event along with the family and on a slightly cold and wet Sunday morning headed down to the Nelson Mandela Metropolitan University. I wasn't sure how a powder paint event would go down in the rain and even if people would still rock up, but we weren't going to throw in the proverbial towel without at least finding out. With dark clouds on the horizon we arrived at the start finish festival area but the music was pumping, the Algoa FM DJ's were working the crowd and people were being very festive. As we lined up for the start the rain came down and for a minute there I thought people would head for their cars but Gordon Graham and the other joc's just turned up the volume and got people more in the spirit of... well... getting dirty while participating in the happiest 5k on the planet. And that was what it was. Once the gun went the rain was forgotten and the fun started. I wouldn't quite call what we did the happiest 5k run on the planet. Probably the happiest 5k stroll on the planet. You can have more fun with each other and fellow participants while walking and that was what we did most of the way. By the time we started most people were well and truly coloured, but as if that wasn't enough we had a new colour added to our designs at every one kilometer mark while there were music and entertainment mixed in-between. By the time the finish line was reached most people were well and truly coloured in and most mothers would throw away clothes looking like ours. The finish line wasn't the end of the party though and most runners gathered in front of the stage where a puff of paint went up every few seconds. It truly was as if a flock of flying unicorns went over head all day long. I'm sure there are a couple of people heading to work this morning with green, blue and pink coloured streaks in their hair and other body parts (he says looking at his purple hands while typing this). Drama Princess for one has a purple glow to her hair while the Damselfly has a bright green wave on the top and pink in the back. That after four washed yesterday. A badge of honour warn in remembrance of an epic morning of dirty clean fun. Or is it clean dirty fun? 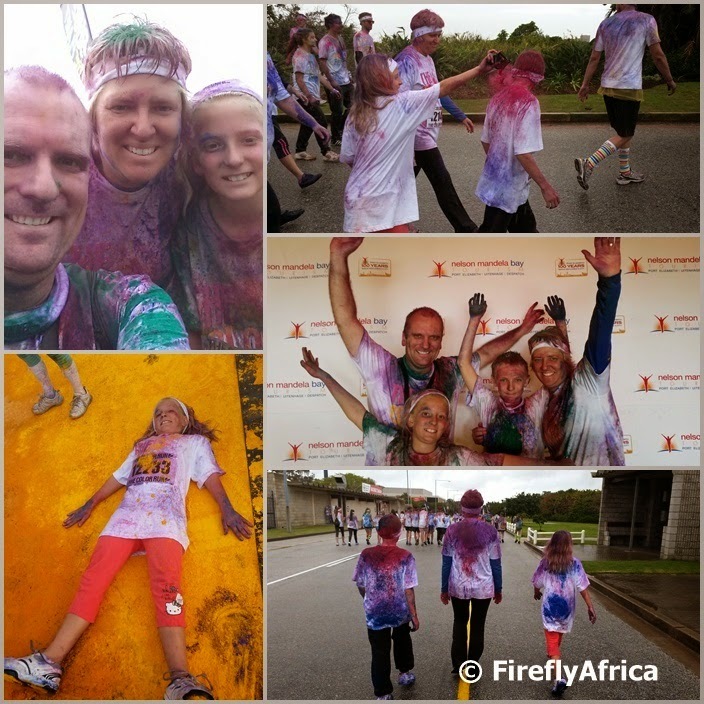 Disclaimer: We participated in The Color Run as guests of the organisers and Nelson Mandela Bay Tourism. A road trip to East London from Port Elizabeth along the N2 via Grahamstown. The historic Fort Peddie in the town of Peddie dating back to the Frontier Wars. A geocache. These three things added up to a great solo adventure a couple of weeks ago. I've been eyeing the cache at Fort Peddy for a while now but a trip to East London for a meeting was the excuse to do it. 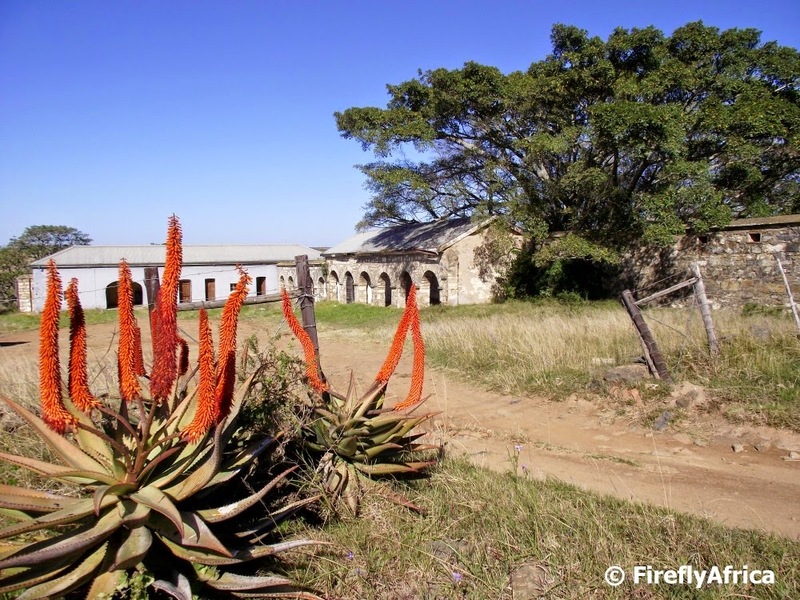 This fort was built in 1835 on the banks of the Hlosi River and named after Colonel John Peddie, commanding officer of the 72nd Regiment (Seaforth Highlanders). 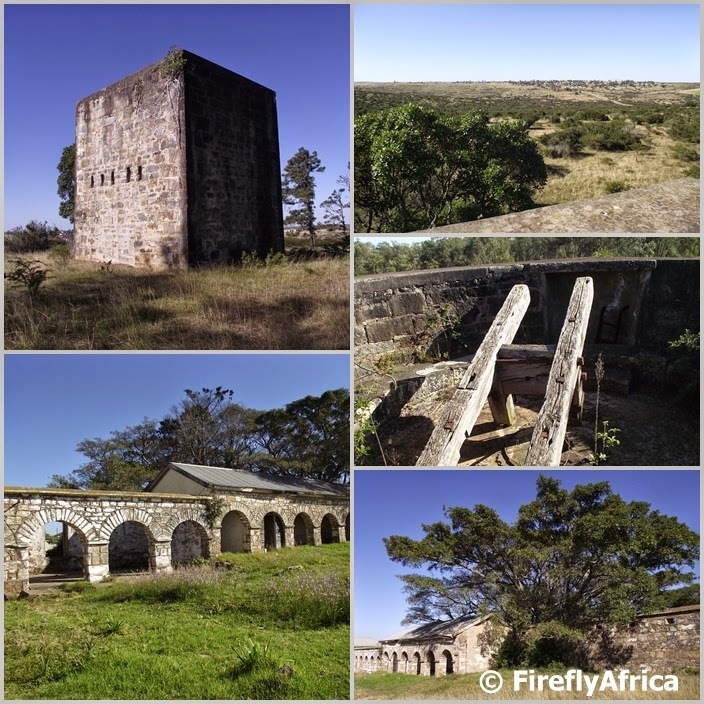 In May 1846, during the War of the Axe, Fort Peddie successfully withstood an attack from about 10 000 Xhosa warriors led by Chief Dilima. None of the people manning the fort were hurt or killed. The fort consists of a tower and cavalry barracks, both of which are still visible. This tower is one of many built to try and improve communication between Fort Beaufort and Fort Selwyn in Grahamstown. The idea was to build a line of towers within telescopic sight to communicate messages between each other. There were two lines known as the Peddie Line and the Beaufort line. Communication was done by the use of a semaphore, a type of signaling mast first developed by Claude Chappe during the French Revolution. The remains of a semaphores can be viewed if you climb to the top of the tower. The cavalry barracks is just down the hill from the tower. The barracks and accompanying stables were built in 1840. They were first used as living quarters for the Cape Mounted Riflemen and the 7th Regiment, led at the time by Colonel Henry Somerset, son of Lord Charles Somerset, Governor of the Cape. During the 7th War of Land Dispossession of 1846, these two units created a turning point in the hostilities by successfully repulsing Xhosa warriors at the Battle of uMgwangqa about 6 kilometers from Peddie. But back to my adventure. The cache is located on top of the tower and I knew I had to take a "special tool" along. The special tool being my fold up ladder which although it fits in my boot can also unfold to be about four meters tall. The ladder of cause was necessary to get me in the tower's door which is about 3 meters up with no steps. Inside the tower I found no floor so I had to pull the ladder in to be able to climb down and up on the other side again. 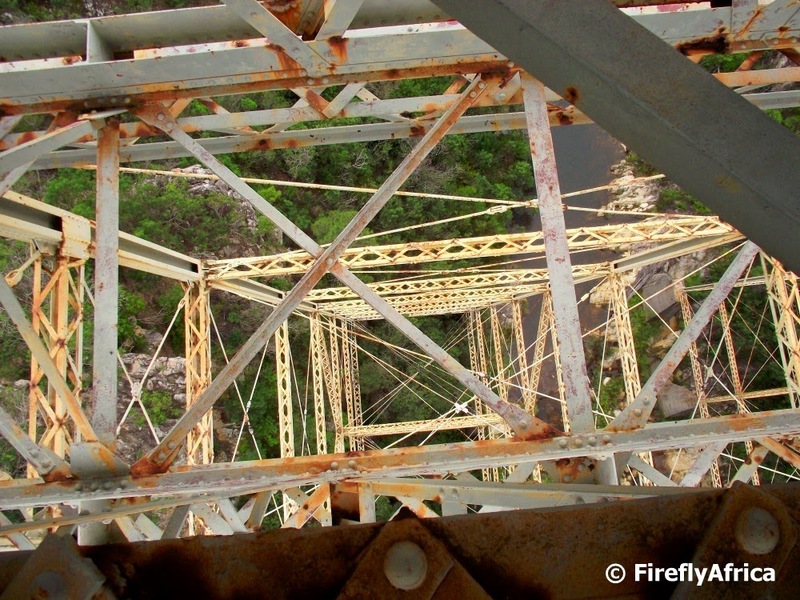 From there it was up a rusty ladder attached to the top of the tower bouncing only slightly less than my heart as I climbed to the top. After enjoying the view I started my search and found the cache container ... no, I won't tell you where. Log sheet signed and container returned it meant that it was now time for me to make the return journey down the ladder and back towards the door. Mission accomplished. One more stop took me for a look around the old stables and shortly after I was back on the road towards East London. If I wasn't a Geocacher, would I have done the little detour to go and have a look at the fort? Probably not. It would also have meant that I would never had discovered this historic spot. Geocaching doesn't just turn one into a modern treasure hunter, but also into an explorer. 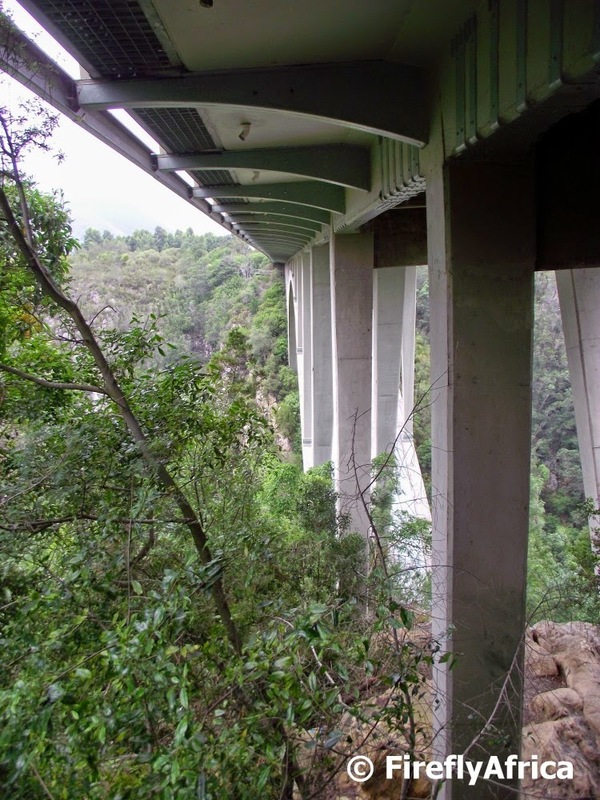 Driving along the N2 through the Tsitsikamma you have to pass over the Storms River Bridge with most visitors stopping at the Petroport for a view of the bridge from the view site or into the gorge from the bridge itself. To get to the walkway on the southern side of the bridge you have to first go under it giving you this slightly different view of it. Aloes of different varieties brighten up the winter landscape in the Karoo over this time of year and driving back to Port Elizabeth from Nieu-Bethesda yesterday I was just reminded of that again. This photo wasn't from that trip though. 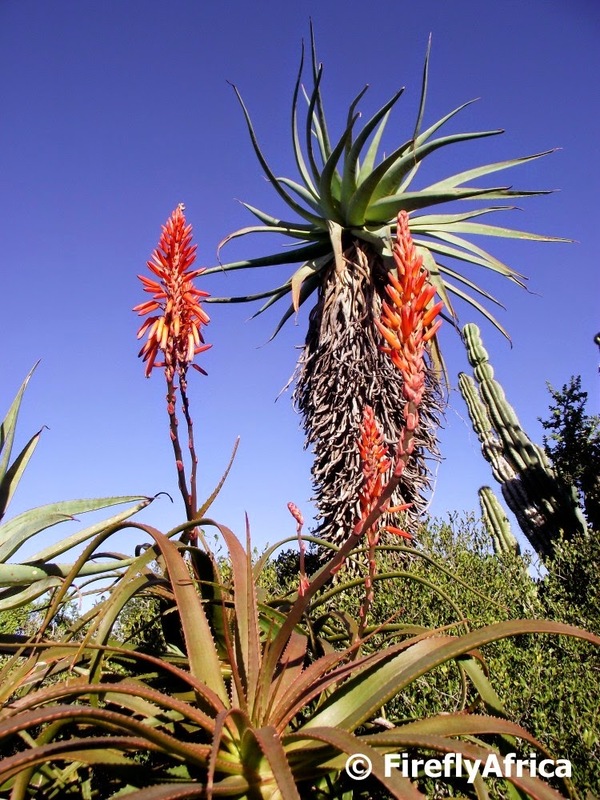 It was taken on the Aloe Trail just outside Port Elizabeth. When I first started blogging I decided to give my family their own blog identities as to not use their real names online. The mrs became Damselfly and the KidZ was hence forth known as Chaos Boy and Drama Princess. Over the years these names have became part of them to the extent that they chose to go as that in the world of Geocaching as well. So many people now know them by those names and always want to know how they got them. Chaos Boy is the oldest and is 12 years old. When people first meet him he is quiet and subdued and it makes them think that he is the absolute opposite of what his name suggests. What people don't always know is that even though he is an introvert, he also has ADD and this usually comes out when he is in a familiar environment. Like home..... He's room is, well, a boys room and a minefield for anybody trying to walk in there in the dark. You need to tell him a thousand times to brush his teeth, throw his clothes in the wash, do his homework, and, and, and. All typical kids stuff, just enhanced. He prefers to watch tv and play games over going outside, but is in his element when we are out and about on our travels. Sharp as a bread knife and highly intelligent but a struggle to get him to focus on studying. That is why I decided on Chaos Boy. Drama Princess is 9 years old and in many ways the opposite. She is highly competitive, loves sport and is an outdoors gal. She would rather go out geocaching with me than sit and watch tv. She is also a typical girl and can over exaggerate just about anything to try and get what she wants. If I had a rand for every time she nearly died of thirst because she wanted a cold drink while we are out... She is truly a drama queen, just younger. The original Drama Princess. The two of them are also typical siblings who just love to hate each other. They can play together in peace one moment and the next moment its the start of World War III. But they are the perfect travel companions as they are always open to new experiences, visiting new places and doing things. This past weekend we wanted to go away to the Tsitsikamma but Drama Princess got an invite to a hip hop party which made us decided to cancel. Something then came up that meant I would have to do some work combined with going away and I suggested that we ask her if she would rather go to the hip hop party (in which case I would have gone alone) or if she would want to go on the Tsitsikamma Canopy Tour (which I could organize). I am happy to say her priorities are right. She absolutely loved the canopy tour. I'll do a post about it soon. 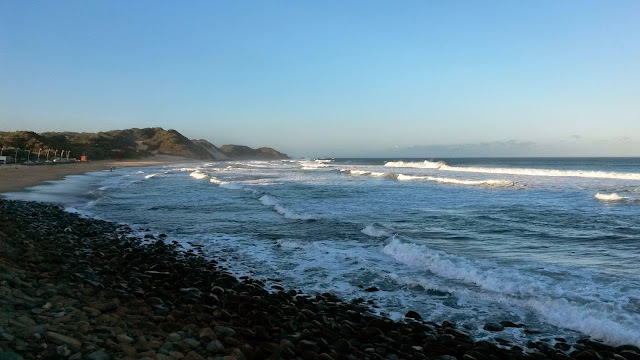 The Wild Coast was one of my last two unexplored Eastern Cape frontiers (the other one is the North Eastern Cape around Rhodes) and I got to do a trip through and explored for two days (more is needed as there is so much I need to go back to see) recently. One of the things I hoped most to see were cows on the beach. Yes, you heard me right. 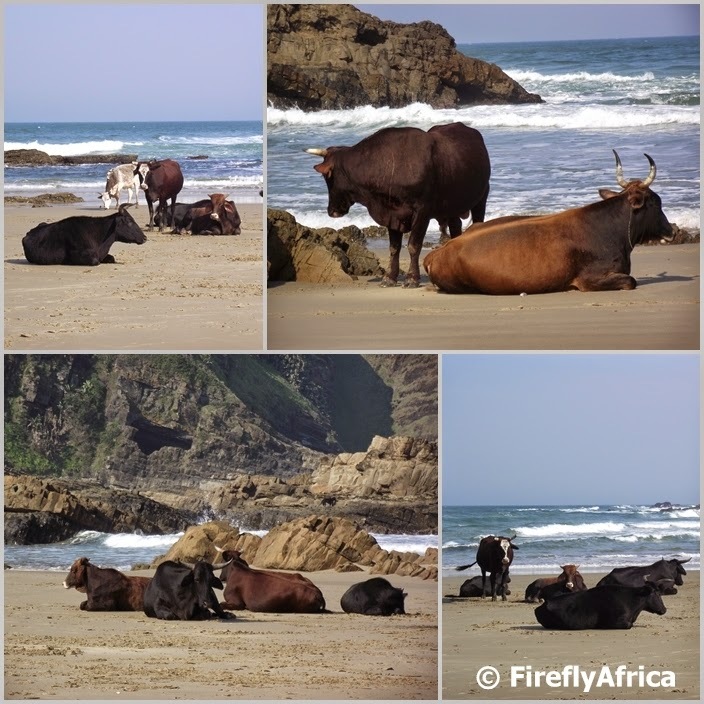 Cows enjoying the sunshine and sand of the Wild Coast beaches. At Mbotyi I saw some off in the distance but arriving at Second Beach in Port Alfred a small heard was chewing their cud on the sand a couple of hundred meters away. I headed straight over with my camera in hand. Clearly they are used to tourists taking their pictures cause they didn't seem very bothered with me playing paparazzi. Now I can hear one or two of you ask what the cattle are doing on the beach. Ticks and fleas apparently do not like the salty sea air. 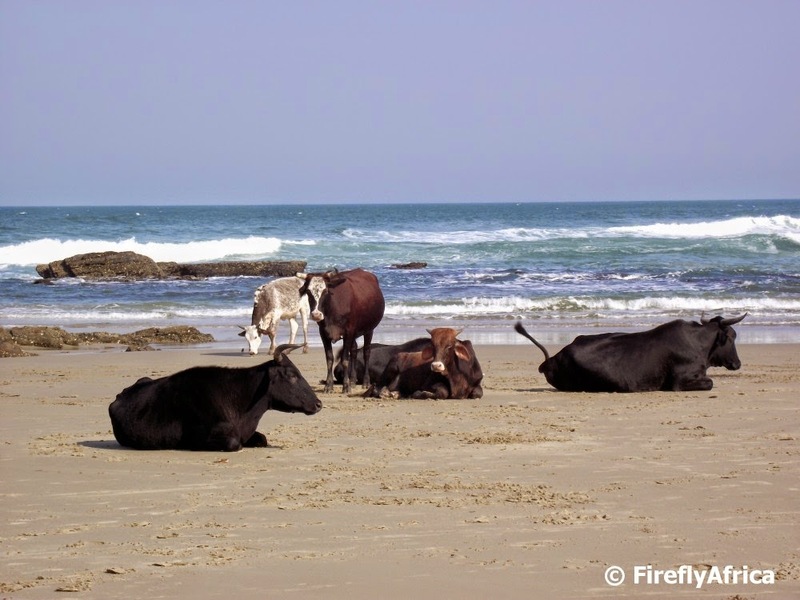 The cattle (a mixture of Nguni cattle and cross breeds) come to the beach on their own accord and sit whist the little critters remove themselves from their hosts. Geocaching is about so much more than using multi billion dollar spy satellite technology to find hidden Tupperware. Its also about exploration, going to and discovering places you may not otherwise have gone to. 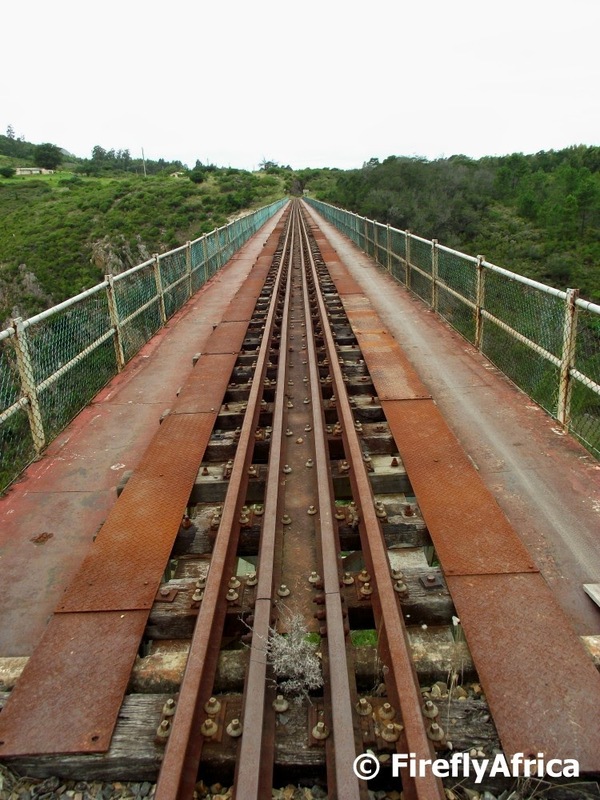 One of these is the highest narrow gauge railway bridge in the world spanning the Van Stadens Gorge outside Port Elizabeth. Years ago when the Apple Express was still running it used to stop before the bridge and passengers could walk across and get a photograph of the train crossing with smoke billowing and steam blowing. This time around I walked in from the closest road to find two containers placed on each side of the bridge. This narrow gauge line from Port Elizabeth was authorised in 1899 and construction commenced in 1902, reaching the town of Avontuur in the Langkloof late in 1906. The line was built to connect the scenic Langkloof with its fruit growing industry to the port of Port Elizabeth. The official opening of the line was in 1907, with a main line track length of 284km (177 miles) from Port Elizabeth to Avontuur. The 30km branch line from Gamtoos Junction to Patensie was completed in 1914 to serve this citrus producing area. The establishment of the deciduous fruit industry in the Langkloof, and the use of the Narrow Gauge to transport fruit to the cooling sheds in the Port Elizabeth harbour for export, led to the popular name for the narrow gauge, namely the Apple Express. It was also the name of the little tourist train that we so badly would like to have back running again. 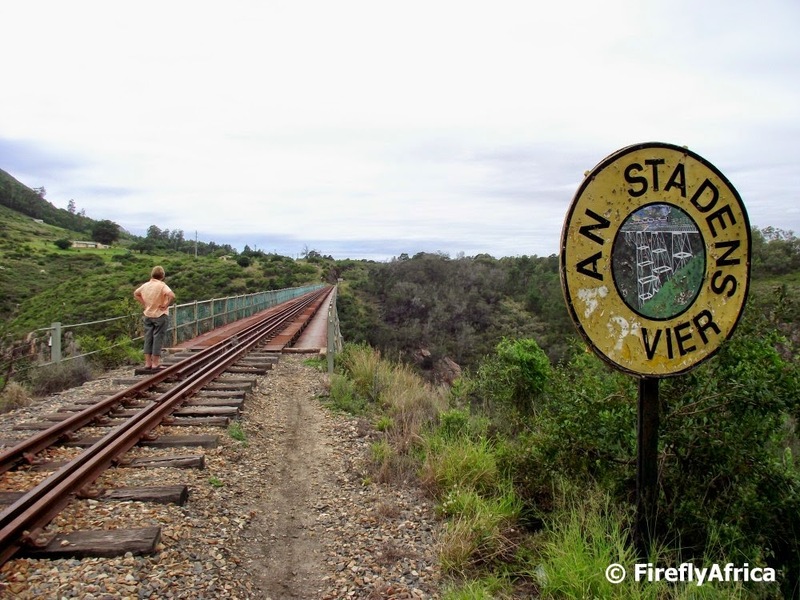 The Van Staden’s rail bridge is the second highest railway bridge in South Africa, and the highest narrow gauge bridge in the world. Construction on the bridge was completed in 1905 with it being 156m long, 77m high and containing 1 112 cubic metres of concrete and 574 tons of steel. I peeked through a gap down to the bottom of the gorge and snapped this last picture. Hectic to think what it must have been like building this. I spotted this scene from the Sir Percy Fitzpatrick Lookout near Sunland between Addo and Kirkwood. While taking in the magnificent view I spotted a green patch in the middle of a couple of ploughed fields. 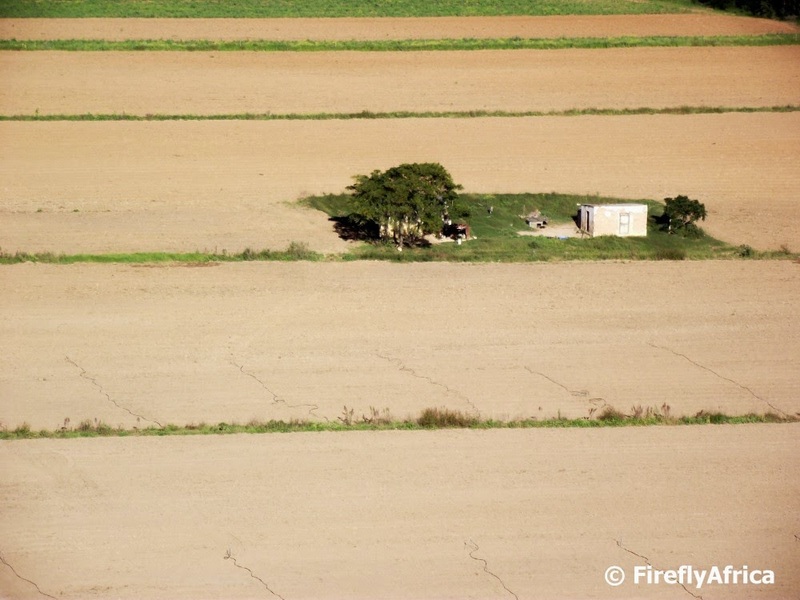 On closer inspection I noticed that there was a farm worker's house and a couple of trees on it. Very peculiar to find a green island like this in the middle of a ploughed field. Over the years the Cape has been occupied by different countries and there was always a threat of an invasion because of the Cape's strategic location. Because of this a big number of defensive positions have been set up all around the Cape Peninsula from the time that the first European's colonised the area. One of these can be seen at the top of Kloof Nek. 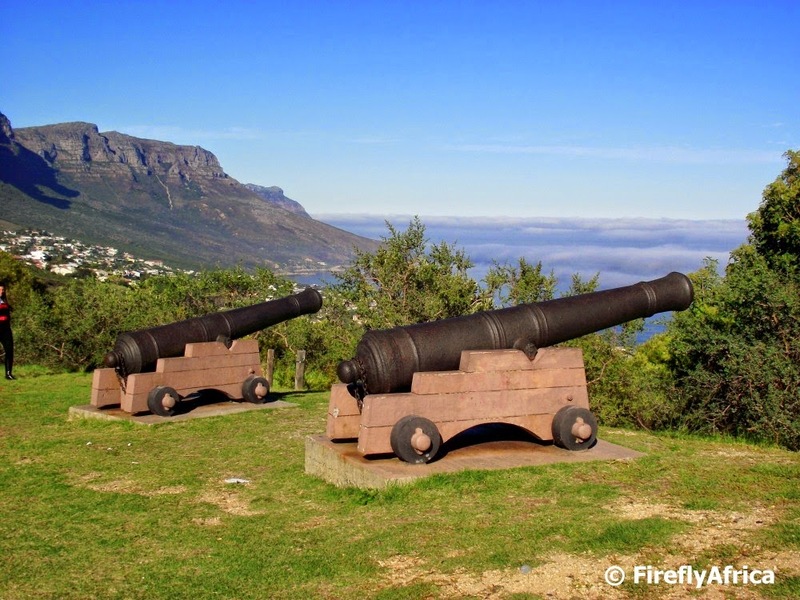 Two 12 Pounder Guns were placed on Kloof Nek in 1782 by the Dutch East India Company (VOC) to defend the settlement near the Castle from attack by a force which could land on the beach at Camps Bay. 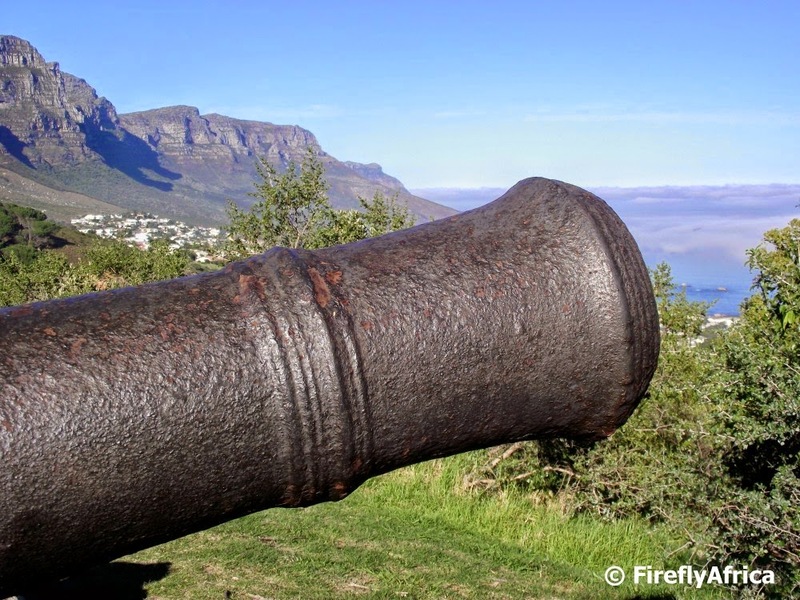 The cannons would have been able to control the wagon track which led from Camps Bay to the Castle via Kloof Nek. So they say that wine is the "Nectar of the Gods". Personally I prefer fruit juice or a Crème Soda, but I'm not totally anti wine. I just never learned to drink it and even though I won't touch a red I wouldn't say no to a nice sweet Rose or late harvest. Even in saying all that I really enjoy wine tastings - see, trying to teach myself to appreciate wine as one probably should. A week or two ago I received a call from my very good friend Geoff Applewhite, also known in the Geocache and cooking world as Shefetswe. Geoff manages the popular Gardenview Guesthouse in Port Elizabeth and along with well known radio personality and foodie Charl Leslie - Charl's Cooking - they host a monthly food and wine paring event at the guesthouse. 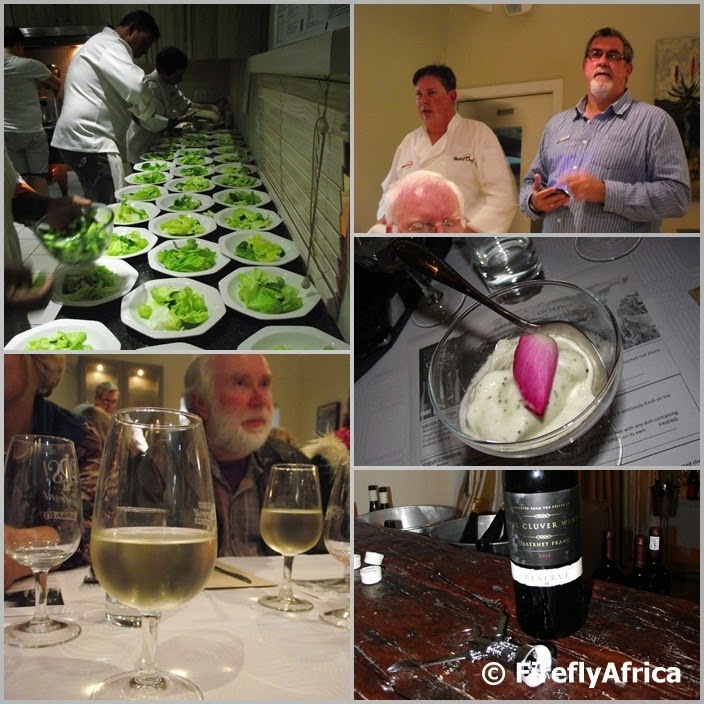 The first event featured bubbly from the House of JC le Roux while the second one involved Durbanville Hills wine. 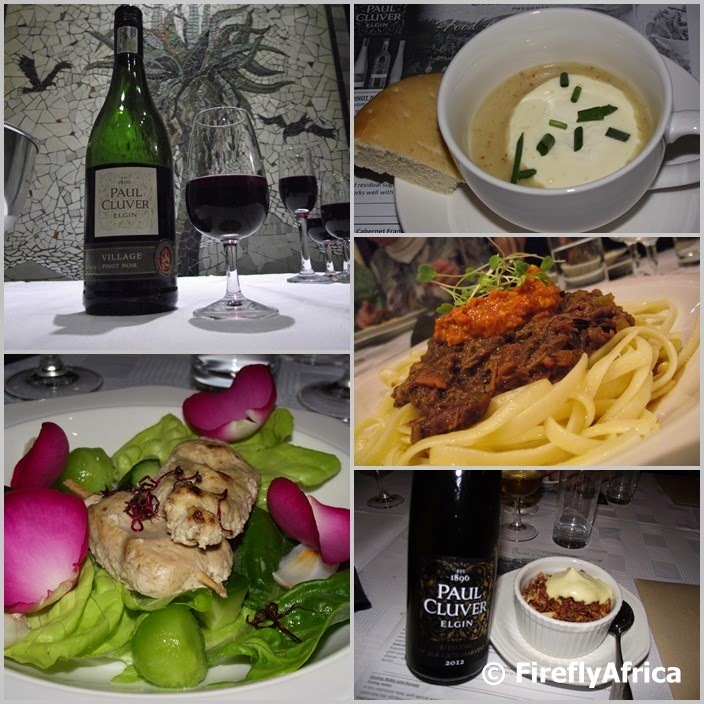 This time around it was the turn of Paul Cluver Estate from the Elgin region in the Western Cape. 50 odd guests rocked up on the night in anticipation of good food, great wine and exceptional company. Nobody left disappointed. Charl's cooking has never let anybody down and once again his pairings were spot on. The wine flowed and even though I struggled to get the red, down the people around me had their glasses filled not just a second but also a third time. Company was excellent. Geoff's witty remarks and the informal way he hosts and interacts with his guests is exactly what a function like this needs. Everybody sits along long tables and your partner is across from you so you could have two strangers flanking you which helps to get to know everybody around you. Have I mentioned the food and wine? Yes I did, but its worth mentioning again. The first wine we received on arrival, the second with the soup starter (my favorite dish of the evening), the third with tangy chicken and salad including litchi and winter melon (my second favorite dish of the evening), a palate cleanser, the next wine along with the main meal and a noble late harvest along with the very yummy dessert (with my diet I shouldn't have but I just couldn't help myself) followed by coffee. A most remarkable evening and great to see the PE folk supporting such events. Keep an eye on the Charl's Cooking Facebook page and make sure you don't miss the next one if you are in town. I haven't spent much time in East London. Always in and out without much opportunity to explore. My last visit was no different but I made sure I had a couple of minutes to swing by the Esplanade and snapped this picture of the beach as the afternoon shadows started to stretch out to sea. 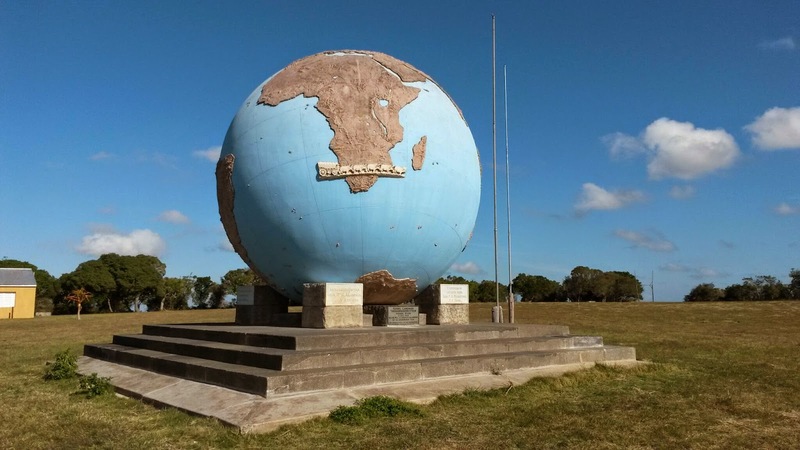 Well known Afrikaans architect Gerard Moerdijk was approached for the design which was approved in May of 1939, although the granite plinth had been inaugurated on 16 December 1938 already. The concrete and terrazzo monument was manufactured by the Lupini Brothers in Johannesburg at a cost of £470 (R940 back then). 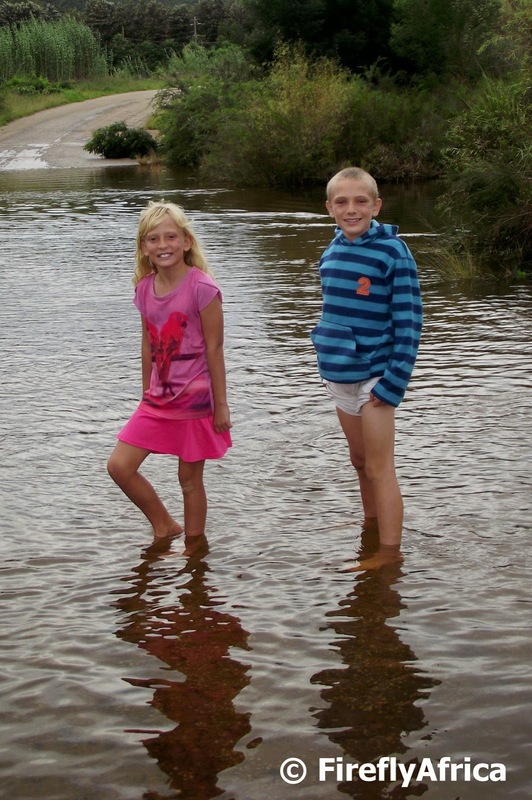 The monument was unveiled later in the year on 16 December 1939 by WA Landman, a descendent of Karel Landman. Fellow travel blogger Dawn Jorgensen of The Incidental Tourist, entered this video into Southern Destinations' #SafariSoulmates competition and was selected as one of the finalists. While all the other entrants chose to showcase their loved ones or best friends as the perfect travel companion, Dawn decided that it was Africa herself. Really gooseflesh stuff making one want to travel. Her dust under my feet, cool dark waters, endless landscapes, oceans, game and incredible people. Wherever I find myself, whatever I'm doing. Be it on the back of a bike in a capital city, hot air ballooning over Hartebeespoort, Gorilla Trekking in Uganda, Whale Watching off Gansbaai, Cheetah Trekking in the Eastern Cape, singing with children or getting soaked at Victoria Falls. 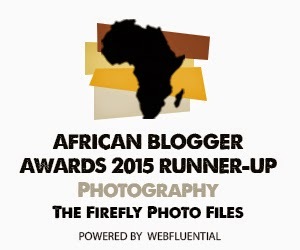 It's my love affair with all things Africa that shines through. Africa is my Safari Soulmate.